Slept around 2.30am because around midnight Andrew was having nose bleeding. And I had the panic attack and decided to run to ICU at the nearest children hospital. The heavy nose bleeding just would not stop for around 15 minutes, I tried to put cold pack on his nose ... maybe because I was too panic I forgot to press his nose to stop the bleeding. But on the way to the hospital suddenly I remembered to press Andrew's nose to stop the bleeding ... silly me. By the time we got to the hospital, the bleeding was off. Ahhh ... this was the second time we run to the ICU for Andrew, hope next time we ... especially me don't get too panic. Oh, so sorry to hear about poor Andrew.. I hope he wasn't too scared with everything.My boy gets nosebleeds during dry weather, and they sometimes last a long time too. I have him lie down and press tissue firmly and pinch his nose. How scary but glad it stopped on its own. Hope everything is back up to scratch with Andrew and also that their exams are going well! Bet you are ready for a nap now after a 2:30 wake up! oh dear, sorry to hear about your trauma but glad everything worked out well in the end! Its hard to think straight sometimes esp. in a panic so i understand. really like your neat egg and seaweed room. the bunnies came out well too, been planing to try some but haven't gotten round to it yet. You poor thing!.... no kidin! blood is always making me panic too. Hope Andrew will be better now. 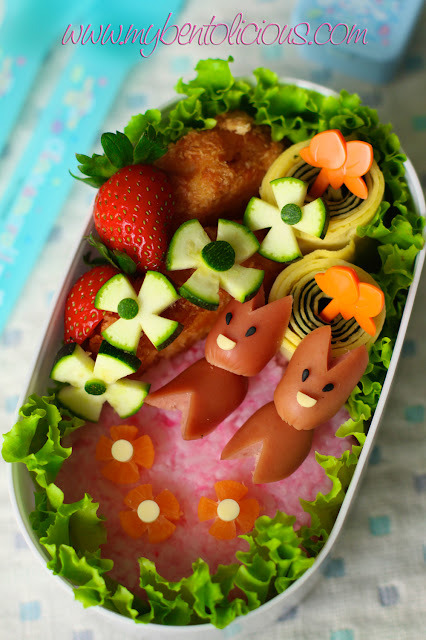 Beautiful bento ^-^ I like those egg-nori rolls and the pink rice. Hope you will sleep well tonight! what a scare with your little guy! glad to hear he's ok.
i love the colors in this bento, and the nori-egg rolls are so precisely perfect - you have a gift with egg sheets, really!